A defense lawyer hired by one of the murderers is now blaming Pham for the attack saying that the Chapman graduate, who was a writer and who worked with several charities, threw the first punch. She was a petite young lady and we’re supposed to believe she attacked her killers? For some reason the SAPD is referring to Pham’s murder as an “altercation.” Are you kidding? Pham was literally kicked to death. How is that an “altercation” According to Dictionary.com, altercation means “a heated or angry dispute; noisy argument or controversy.” What happened to Pham was no altercation. It was a lynching! In related news, Santa Ana Councilman Vince Sarmiento, a lawyer whose family makes a living running bars in the area, said at Tuesday’s City Council meeting that the killing of Pham, by a group of Latinos, was not a hate crime. How he reached that determination is as of yet unknown. 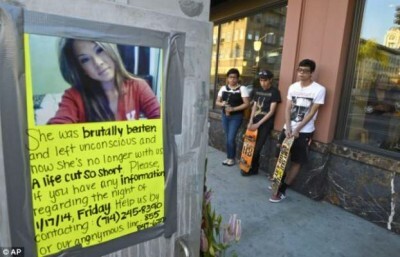 Pham is the second Asian to be murdered in Downtown Santa Ana in the past two years. A Korean American resident of Irvine was shot to death in a DTSA parking structure after leaving the Proof Bar. Ah, but tell people the truth about the unfortunate shooting that happened a few years ago in that parking structure. You always leave out the truth and details. Always! The truth? That robbers killed him? Who ever writes this stuff sounds like a racist. Exactly. Not a hate crime because there is no evidence that it was a hate crime. You and your race card. Sigh. The hate crime designation will be the final nail in the gentrifiers’ coffin. I have never heard Mayor Pulido utter the word “gentrifier” or “gentrification”. Never heard him say it, never seen it in writing. Would you say Mayor Pulido is clueless on that subject? I am told there is INCREDIBLE pressure on the PD to move slowly and deliberately on this case. “No one is trying to cover anything up, but, clearly a lot of people are concerned about the public’s view of Downtown Santa Ana” That’s a quote from my neighbor, a longtime SAPD detective. He said anytime the City Manager, Council Members and Property owners like Ryan Chase check in DAILY on progress the message is clear: BE CAREFUL. He went on to say it won’t change the outcome of any investigation, just prepare them to better spin it like Vince tried to above. to begin fights are never one sided. also why haven’t witness statement been reported countless times. her life and job keeps coming up on everything what she did and what not. but what about the witness statements that the media keeps ignoring like that Kim was with at least a dozen of her friends in line and when the fighting started its was about 12 vs 5. you mean to tell me the 5 people over powered 12 individuals plus the 1 or 2 security guards that were there! what were her friends doing video taping the incident instead of helping their friend? with friends like that she wouldn’t need enemies. Yes at the end of the day Kim died for being in an altercation were eye witnesses say she threw punches first. so once again this is never a one sided story like the media is trying to claim. but the day in court will come were the truth will come out. there has been more than a few incidents were Latino’s have been killed by asian people so that race card kims followers keep playing is getting old. I don’t believe this was race related, and I am an Asian teacher working in Santa Ana. The perpetrators are just thugs…period. By the way, let’s not drag other issues of which race killed whom…this is not a tet a tet…We are discussing the death of a young woman, Asian OR Latino – it does NOT matter. There is video evidence that at least one of the killers called Pham a gook. That is racist. Ok. It IS race related for me, then! Interesting… some people like santa ana patron just make things up. Wow. Exactly–what incidents? Precisely, Zach. Where are the facts, details, statistics??? Maybe santa ana patron can shed some light on our inquiries? Where do you hear about this ‘dozen friends’ B.S. ? The media has been attesting to eye-witnesses stating that she was with like 3 other people. What kind of garbage are you spewing? Regardless of what happened here, spreading random crap is just plain despicable. 12 to 5? Where are you getting your purposefully inaccurate information? Stories aren’t every truly one-sided, but YOU sure are making this one VERY one-sided. Totally disgusting bias and hypocrisy in your comment. I just read that it was Zavela’s DEFENSE ATTORNEY who said Kim Pham threw the first punch. You SCUMBAG. Why wouldn’t you mention that? You are a seriously biased POS. Oh we mentioned that in one of our posts. He is a defense attorney as you referenced in your rude comment. What do you suppose that defense attorneys are paid to do? Give me a break. Editor — you have the wrong idea. I was talking to ‘santa ana patron’ who is telling half-truths because they are obviously biased and blaming the victim. They were the ones who implied that ‘witnesses’ all implied that Pham started the fight as if she deserved her fate. I was answering them, in that it was the DEFENSE ATTORNEY (who are paid to potentially LIE for their clients–and this one has reportedly has a past record of doing so as well as victim bashing) AND NOT ‘witnesses’ stating that Pham threw the first punch. I can see where you’d make your mistake as there are plenty of idiots attacking you on this site. However, I am not, and am on the side of reason. The second ‘implied’ was meant to be ‘stated’, in the post above. Sorry. Fact – it was motivated by race by calling the girl a gook it clealry makes this a hate crime no less than Matt Shepards case , and to present it as anything less would be a crime. I believe why the police are being slow to capture and reveal the ID’S of the animals that did this is also racaily motivated . To portray this as the Cholos gang attack that it really is might support the far too many reviews of d.t.s.a. that detail mexic-ghetto gang activities that have now left two Asians dead. It’s beyond damage control make it go away.An honest evaluation of the hispanic gang crime issue is the only answe. Kim Pham’s life taken away too soon must mean more than the P.C. lie that cost her her life. Decent people with money are not going to want to visit or dine out in area’s known for gang issues like this.If this is not pros as a hate crime I think people should avoid the down town area as a tribute to KIM PHAM that should have had the right to enjoy an evening out with out having her skull bashed in after being kicked by cholos gangstas. Really D,P, HATE CRIME or people with an IQ above 40 avoid D.T.S.A. Now you are talking! If there is no justice then there should be a boycott! Right. In fact, the opposite is going to happen! The art walk the 1st Saturday will prove it! My reliable source says the RSVP lists for events that night are seeing even more people ‘joining.’ That’s great! The boycott should be in full effect by then. I know, it takes a bigger man to admit when he’s wrong and that bigger man ain’t you. I know it hurts, the truth. Truth is, DTSA is just fine. Have a wonderful night and don’t forget to lock your doors. Is that a threat? I’ll be forwarding your IP address to the police. A) I ddn’t know there was an “RSVP” list for artwalk. B) The same (number) of people that attended before will likely attend again mostly because it’s what they do. C) Instead of championing how great Downtown Santa Ana is and continually running defense, why don’t you openly address the safety issues that are at the core of these matters? D) where is leadership on this? Michele Martinez is MIA, Benavides seems like he is harboring a fugitive: SPEAK OUT AND LEAD. They certainly had enough to say when their contributors wanted to extend the drinking hours! A safe, balanced responsible Santa Ana helps us all, but dangerous understaffed irresponsible business like the Crosby will destroy this dream faster than you can say GhostTown. Maybe Joe Dunn was right, Downtown Santa Ana is unfit to support a major court. Hey idiot, there are EVENT PAGES created via social media and people RSVP. There are multiple music events, fashion shows, and art exhibits going on the night of the art walk. East End and The Artist Village. So yes, lists of people invited and lists of people going! Oh, Downtown Santa Ana is far from a ghost town. You know the truth. Sorry. You did not win and you won’t win. Step aside, the people running the show and they are not stopping anytime soon! Lot’s coming our way!! Yes it is obvious that making money is more important to the gentrifiers than anything else. You better be in your apartment before the street lights come on and board up you windows! It’s just going to be out of control in Downtown Santa Ana! Run for your life! Guns, knives, boots, shoes, cell phones, cursing, oh my! Shut the city down before we all die! Idiot. This world is coming to an end, people are really loosing respect for each other. Can we all just get along. Personally, I can’t stand Santa Ana. When there is a time I have to spend some time there, I get stared at with rude eyes. Once, I was returning to my car when some hispanic girl told me to go back to China. I didn’t respond. She had to continue “I’m talking to you, f**king gook!”. Now don’t tell me this is hate.